Step Up to Leadership is a FREE 12-week class for adults (ages 18+) and a 4-day class for students (ages 15-21) that we offer in the spring. The information covered in this class can be adapted for any age group or skill level. The main goal of this class is to help shine the light on the positive qualities and skills of our participants, and strengthen the skills they feel they need to improve. While there is a set curriculum ranging from how to work with varying types of personalities, identifying each individual’s passion & goals, the legalities & obligations of being a board member, how to resolve conflict, best practices for public speaking and how to write a grant, each session is adapted to meet the needs of the participants. 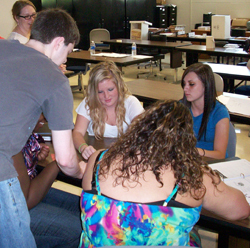 The classes include activities, group discussions, games and a manual of all the information covered in each session. Upon completion of the class participants have the opportunity to plan their own graduation celebration. Graduates of the adult class also have the opportunity to write a competitive mini-grant to implement their own community project.